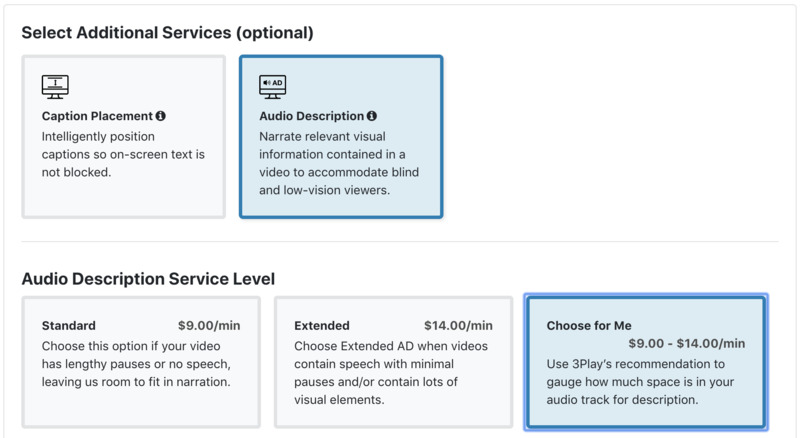 If you’re not sure whether your video is a good fit for standard or extended audio description, you can choose to use 3Play’s recommendation. 3Play’s recommendation is an automated process that evaluates the audio track of your video for natural pauses in speech. This process does not take into consideration any visual aspects of your video; it is merely a gauge of how much space is available in your audio track for description. Note that this is an automated evaluation, and we recommend reviewing your file before ordering. If the recommendation is “Uncertain,” it means that our describability evaluation has returned a score in the grey area between the clear range for extended and standard. We recommend reviewing your file to determine the best fit. For new uploads, you can select “Use 3Play’s Recommendation” upon upload. 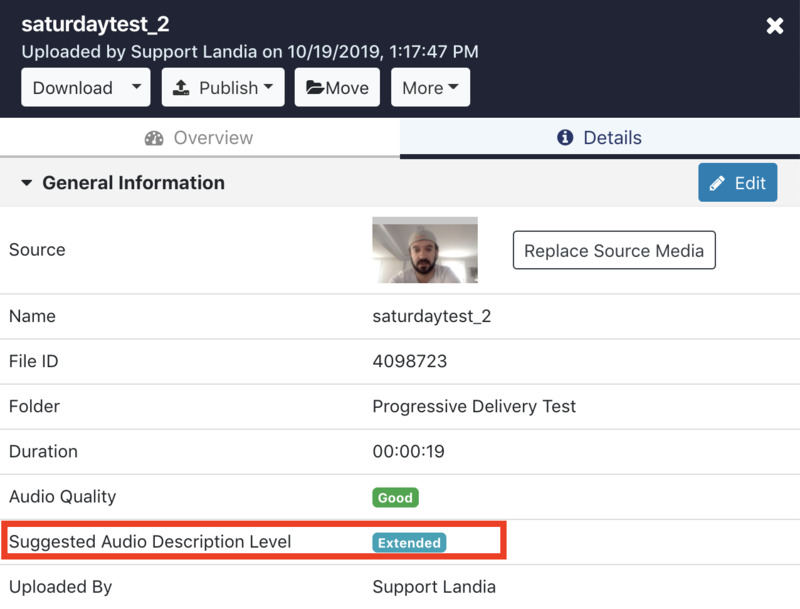 Note that at this point, we will not have calculated the describability of your file, and you are committing to using our automated data to determine whether your file will be submitted for standard audio description or extended audio description. Navigate to Upload Media to upload your file from your computer, via links, via cloud storage, via an integration, or via FTP. You can also upload using our API. Select Add Audio Description, then choose the service level you want to order for audio description. Select Use 3Play’s Recommendation if you want to use our automated recommendation for standard or extended. Remember that when uploading new files for audio description, you are committing to using 3Play’s recommendation without being able to review it first. Follow the rest of the steps to select turnaround and location, then confirm your order details and place your order. For files that already exist in your account, you can order audio description using 3Play’s recommendation. Because we have already transcribed your file, you will see an indication of 3Play’s recommendation when you order. From the My Files page, select the file(s) you want to submit for audio description. Select Order > Audio Description. You’ll see 3Play’s suggestion listed next to every file selected for audio description. The drop down service level selection will default to our recommendation for each file. For uncertain files, it will default to whichever service option is the closer match - we recommend reviewing these files before ordering. If you would like to change the service level, simply use the dropdown to switch between standard and extended. The total cost displayed will update to reflect any changes. Note: If your transcript is still being processed, the file you select for audio description could have a 3Play recommendation of “Pending.” In this case, you can choose to submit your file using 3Play’s recommendation without being able to review the service level recommendation prior to processing. Because we do not yet know whether the file will be standard or extended, the price calculated will reflect the maximum total if your file is submitted for extended description. The price will be adjusted if your file is submitted for standard description.